The latest album "COLONIZING THE STARS" by George Bellas contains nine epic compositions in a futuristic style with a palette of lyrically-flowing melodies, otherworldly harmonizations, and inventive rhythms all sounding through a barrage of guitar, bass, drums, choirs, and orchestral instrumentation. Inspired by modern and futuristic scenarios of humankind's existence alongside artificial intelligence and the need to colonize the stars in order to prevent the extinction of the human race. Envisioned in a time where the human species is living and breeding on new worlds throughout the universe, where entirely new languages and human form and cerebral abilities have evolved. Traveling to distant stars has been accomplished using a technology that encapsulates and transports human DNA along with eons of collective information to the outer reaches of the cosmos within light waves. Colonizing The Stars is available on CD, digital download, and through streaming services Spotify, Apple Music, Pandora, Amazon Music, Google Music, iHeartRadio, and more. Russian editorial site Guitar.ru recently interviewed George Bellas regarding his career as a prolific composer, guitarist, and teacher. The interview was conducted in February of 2019. 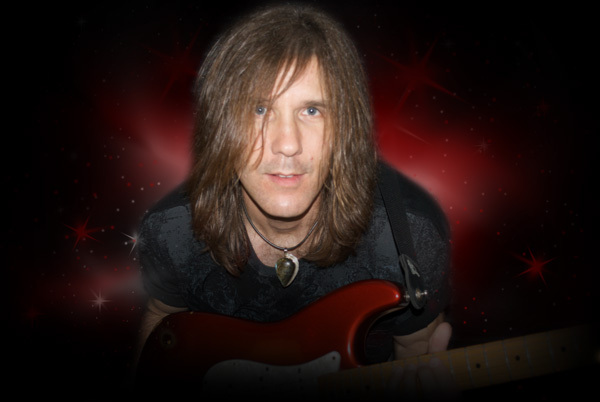 "George Bellas is much more than just another guy who knows how to play electric guitar very quickly and technically. He is a serious composer, innovator, and musical teacher who generously shares his knowledge with students. — Guitar Russia"
"Monumental orchestral arrangements with a fascinating interaction of guitar, keyboards and choir." Copyright © 2018 George Bellas. All Rights Reserved. 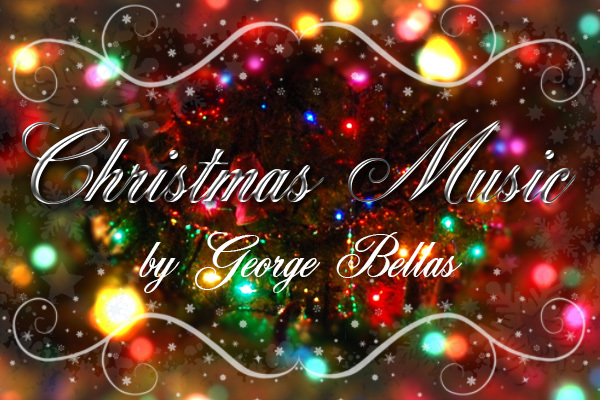 Celebrate this holiday season with Christmas music arranged and performed by George Bellas. These are classic Christmas carols arranged for acoustic guitar and played as duets and trios. 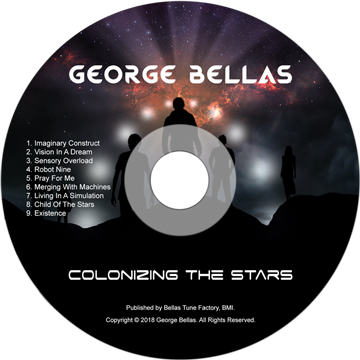 The 2018 album "COLONIZING THE STARS" by George Bellas contains nine epic compositions in a futuristic style composed for one guitar, orchestra, two choirs, bass guitar, and drums. Learn music composition in an environment that fosters creativity while increasing your understanding of writing techniques that have been used for centuries by classical composers along with uncommon modern principles found in progressive and modern film music. 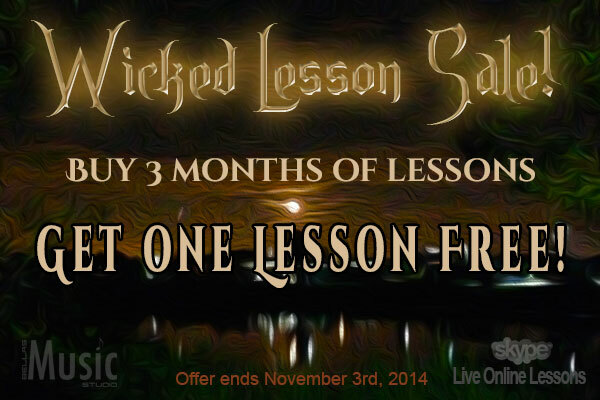 Purchase 3 months of Skype based Live Online Lessons and receive one FREE lesson! The more you book in advance the more you save. Reserve your time now. 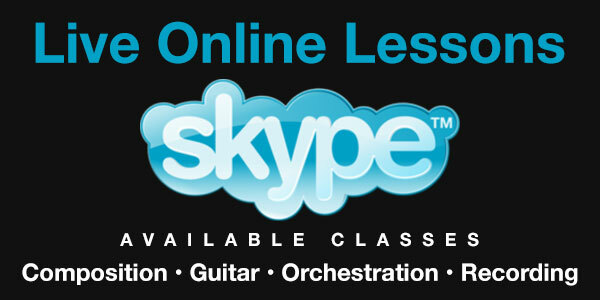 Live Online Lessons is a Skype based lesson program that offers composition, guitar, orchestration, and recording classes with composer and guitarist George Bellas as your instructor. This program presents a myriad of unique challenges that continuously strengthen and develop your skills as a composer, guitarist, orchestrator, and recording artist. The score to the composition "Existence" by George Bellas is now available. 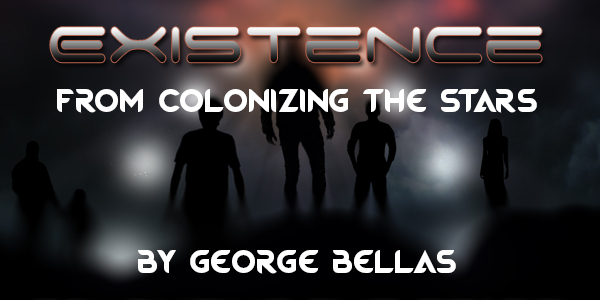 Existence is the ninth composition on the 2018 album “Colonizing The Stars” by George Bellas. Several modern compositional devices were used throughout this composition, including numerous odd-meters, non-tertian harmony, symmetrical scales and more. The album Colonizing The Stars is available on CD, Digital Download, and through streaming services Spotify, Apple Music, Pandora, Amazon Music, Google Music, iHeartRadio, and more. 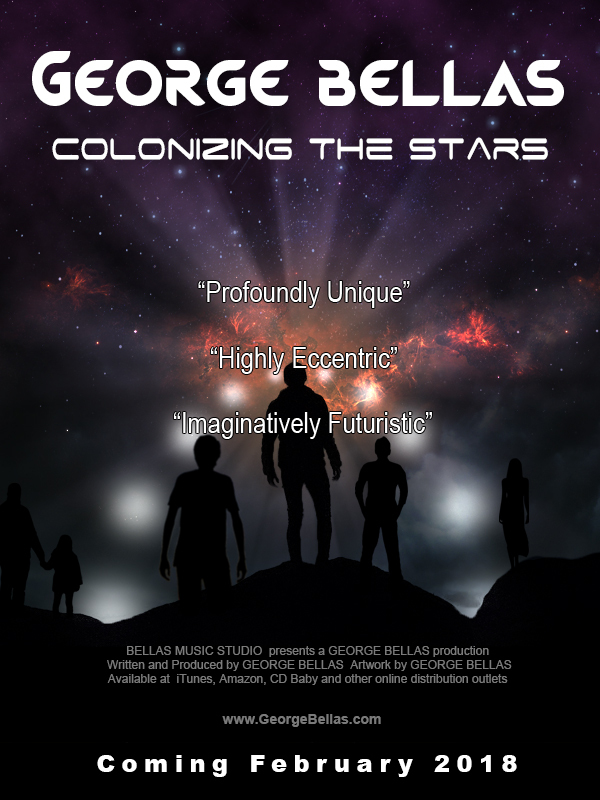 The album "COLONIZING THE STARS" by George Bellas is now available on CD. The new album "COLONIZING THE STARS" by George Bellas contains nine epic compositions in a futuristic style with a palette of lyrically-flowing melodies, otherworldly harmonizations, and inventive rhythms all sounding through a barrage of guitar, bass, drums, choirs, and orchestral instrumentation. “Voyage To Triangulum” performed by George Bellas at Uli Jon Roth's Sky Academy Concerts held at Musician’s Institute in Los Angeles, California in 2007. This song later appeared on the album “THE DAWN OF TIME”. Thanks to Uli Jon Roth’s band for providing the bass, drums, and keyboards. 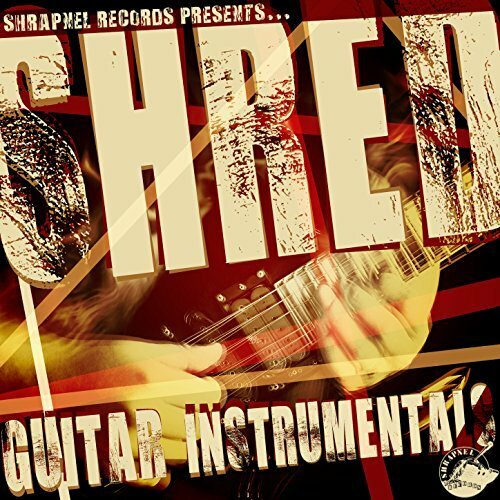 The album "SHRED GUITAR INSTRUMENTALS" on Shrapnel Records is available on iTunes. 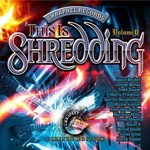 "SHRED GUITAR INSTRUMENTALS" contains fifteen songs by various Shrapnel Records recording artists and features the song "Fast And Furious" by George Bellas. Copyright © 2015 Shrapnel Records. All Rights Reserved. 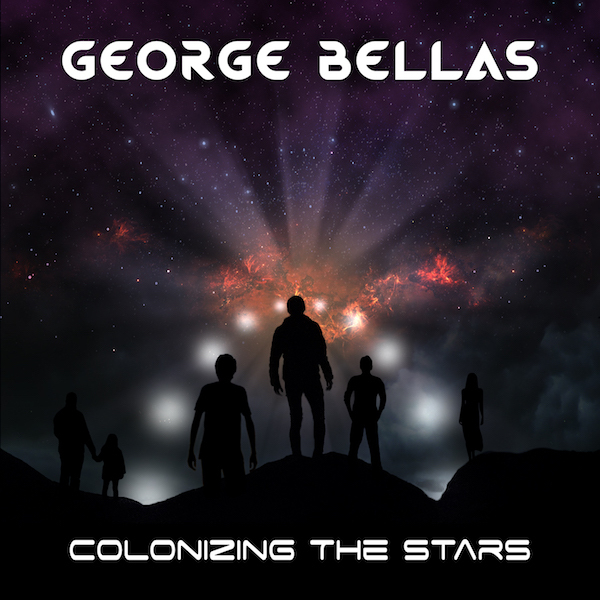 The new album "COLONIZING THE STARS" by George Bellas will be released February 2018. "COLONIZING THE STARS" contains nine epic compositions in a futuristic style with a palette of lyrically-flowing melodies, otherworldly harmonizations, and inventive rhythms all sounding through a barrage of guitar, bass, drums, choirs, and orchestral instrumentation. "Wishing everyone around the world a healthy and happy life in the year ahead." 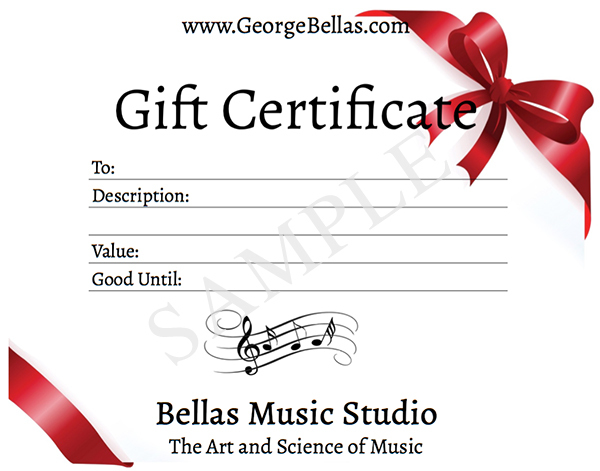 Give the gift of music lessons this holiday season with a personalized gift certificate. Simply place your order for the desired amount of lessons and request a gift certificate in the comment section when placing an order. Learn music composition in an environment that fosters creativity while increasing your understanding of writing techniques that have been used for centuries by classical masters along with uncommon modern principles found in progressive and modern film music. The Student Spotlight is a showcase dedicated to the devoted students who have studied music composition or guitar performance with George Bellas. 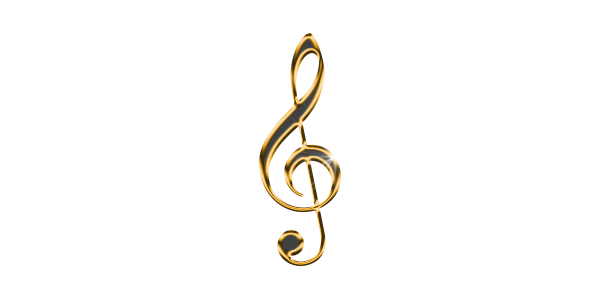 This page is an effort to promote all the hard working music students that are passionate about what they do and create. Please visit the Student Spotlight and have a listen and learn about the tremendous talent from all around the world that George has been fortunate to teach. 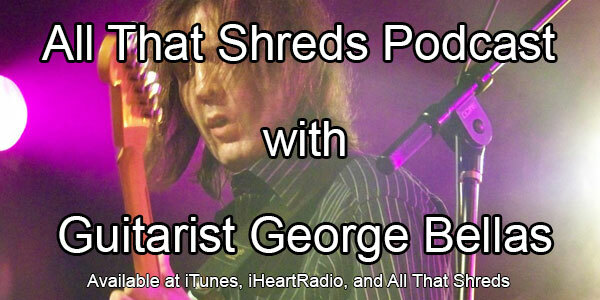 Andrew Catania of All That Shreds magazine recently interviewed George and discussed his career throughout the years. George shares his views on composition, guitar playing, how, when, and why he began playing guitar, along with other bits of trivia from George's illustrious 20 year career as a composer, guitar player and recording artist. Expand your composition, orchestration, recording, and guitar skills with Live Online Lesson classes conducted by George Bellas. 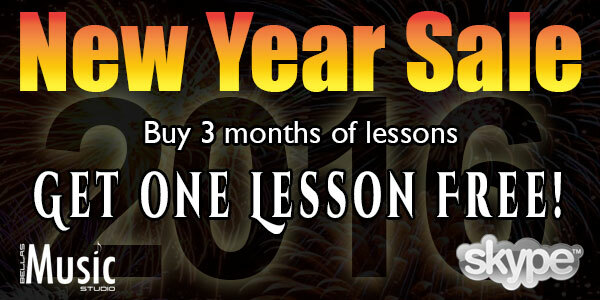 This program contains one of the most comprehensive set of music lessons available. 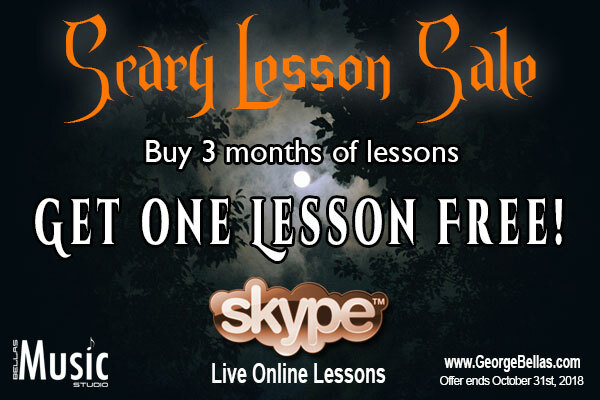 Purchase 3 months of Skype based Live Online Lessons and receive one FREE lesson! Increase your skills with composition and guitar performance classes conducted by George Bellas. 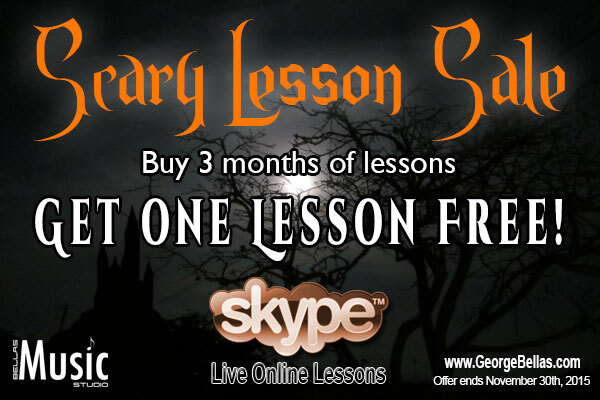 Purchase 3 months of Skype based Live Online Lessons and receive one FREE lesson! On May 20th, 1997 George Bellas emerged onto the guitar scene as Mike Varney's newly discovered guitar prodigy. 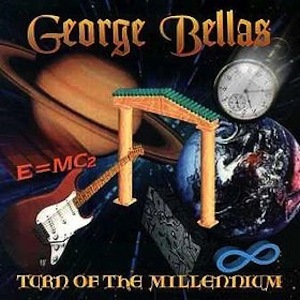 The debut album "Turn Of The Millennium" by George Bellas was released May 20, 1997 on the prestigious record label Shrapnel Records that showcased exceptional guitar playing and musicianship. 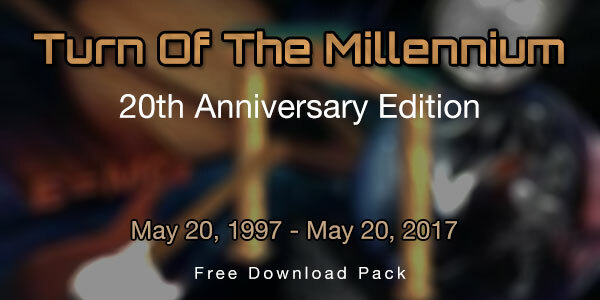 To celebrate the album's 20th Anniversary, a free download pack is being made available for a limited time. The 20th Anniversary Download Pack contains the story of George Bellas before, during, and after being signed to Shrapnel Records, along with a backing track to the song "Ripped To Shreds" and the accompanying score to the main guitar line of the song. 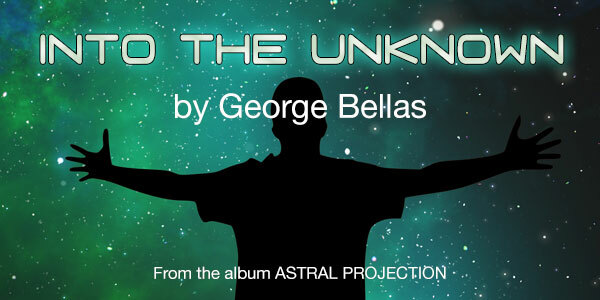 The following is a music video for the composition "Into The Unknown" from the album Astral Projection by George Bellas. This eccentric piece is for guitar, string orchestra, and choir and serves as the introduction to the album. 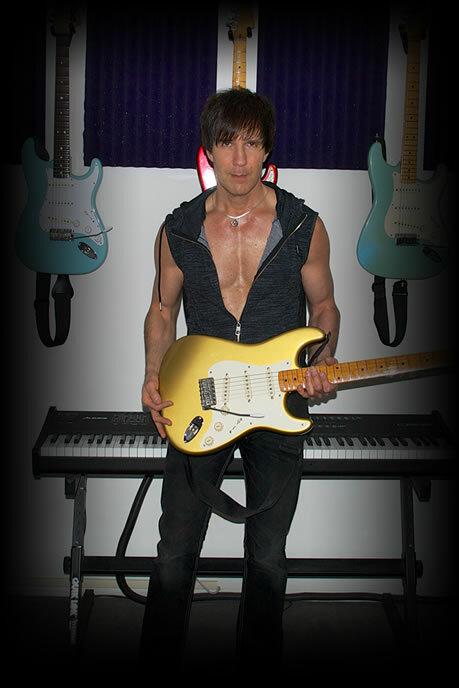 A new guitar etude eBook is now available at the Bellas Music Studio webstore. This is a guitar etude that is romantic in character and is based on open-spaced arpeggios and neighbor tones within a perpetual sixteenth-note line. The harmonic focus is on the supertonic with raised root and third and the submediant with raised root and third that are used as non-functional diminished chords that resolve into the inverted tonic and inverted dominant respectively. The score to the composition "Encoded In Light" by George Bellas is now available. This song utilizes a combination of tonal elements and atonality interspersed throughout the various sections. Several meters including 9/8, 19/16, 11/16, 37/16, and 9/16 are used along with an assortment of traditional and futuristic sounding harmony. This song was inspired by the technology of transmitting data using photons. 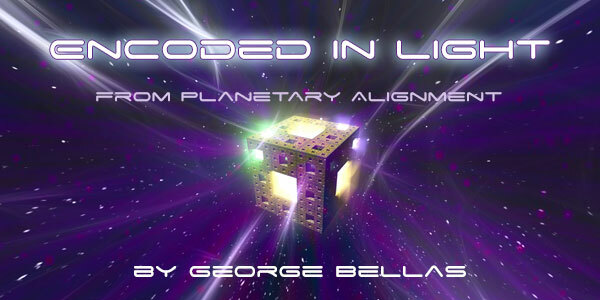 "Encoded In Light" is the second song on the album Planetary Alignment by George Bellas. 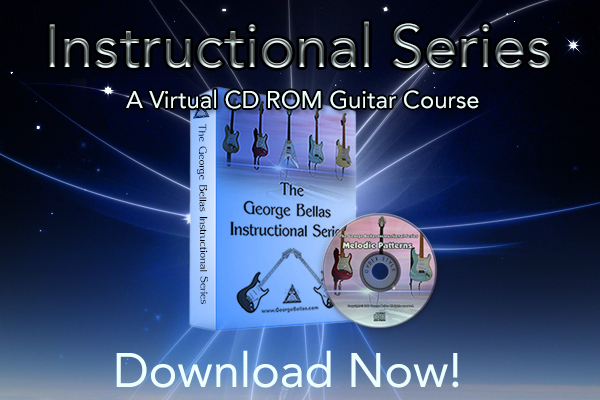 The George Bellas Instructional Series is now available for download. This is a virtual CD-ROM lesson series that contains 12 individual lessons in a variety of topics. 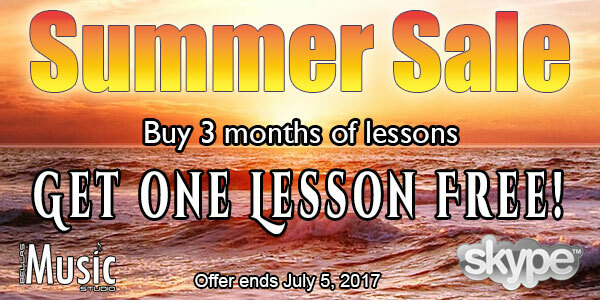 Each lesson comes with video and audio demonstrations, video discussions, an eBook of tab, MIDI files, and an assortment of unique Jam Tracks. This is an updated version of the original CD-ROM lesson series with a new interface and redesigned navigation system. From the music vault of George Bellas comes "Disenchanted", a one take improvisation over a harmonic ostinato accompaniment in minor mode. 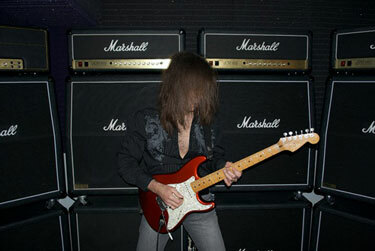 George used a daphne blue 1957 reissue Stratocaster, a tube screamer, and a 1976 Marshall MK II for the recording. 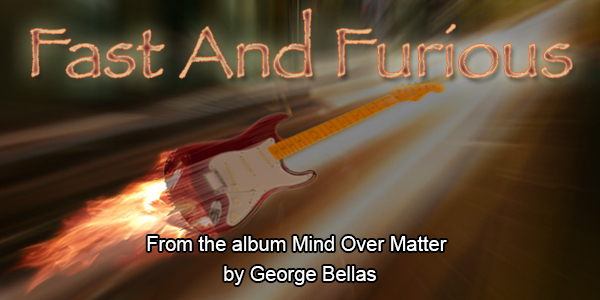 The score for the lead guitar line to the composition "Fast And Furious" from George's album "Mind Over Matter" is now available. This is a neoclassical composition that is chock-full of scale flourishes, arpeggio patterns, and ostinato-like figures, that all soar above an unrelenting double-bass pattern performed by Dean Castronovo on drums and Barry Sparks on bass. The following is a short improvisation from George Bellas and Marco Minnemann. It's not a song, there's no melody and no structure... Just George Bellas and Marco Minnemann going Ballistic! 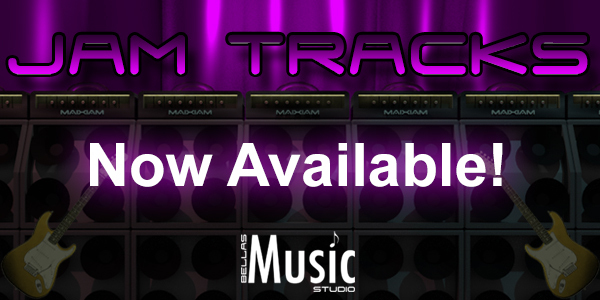 Bellas Music Studio presents high-quality Jam Tracks in 24-bit wav files. 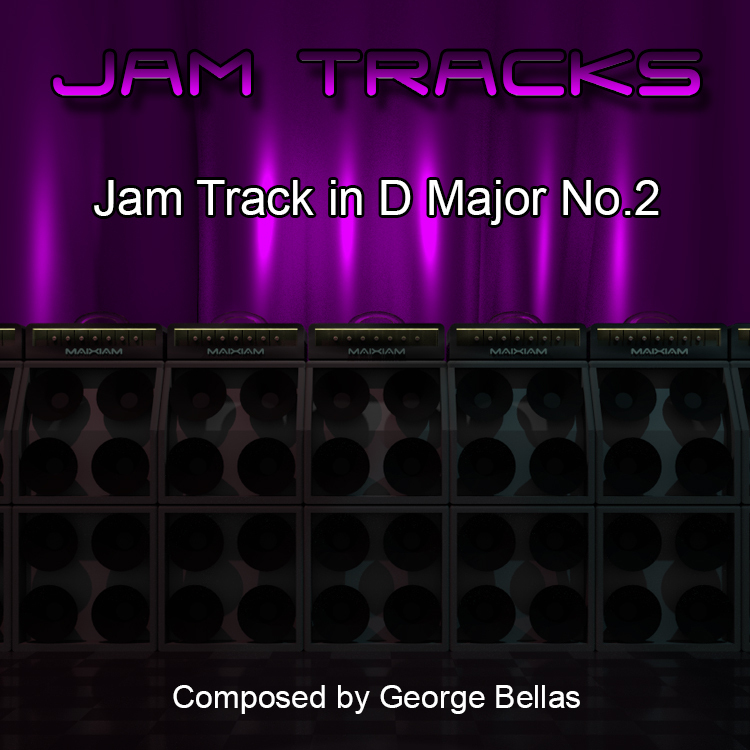 Jam Tracks are unique backing tracks to practice and improvise over. A myriad of different modes, keys, time signatures, and varying degrees of skill evel will be available. The quality of these tracks are pristine and exhibit a clear sonic spectrum for guitarists to play over. 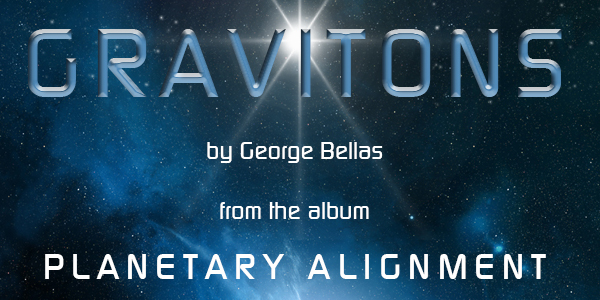 The following is a music video for the composition "Gravitons" from the album Planetary Alignment by George Bellas. This outlandish composition features Marco Minneman on drums and George Bellas on guitar, bass, and keyboards. The following two videos are George preparing to record the song "Into The Unknown" for the eccentric 2013 album Astral Projection. 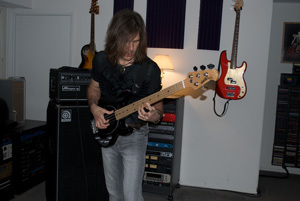 These videos were recorded just prior to recording the final takes for the album. George preparing to record and working through "Into The Unknown" against the orchestral string tracks for the album ASTRAL PROJECTION. Practicing parts for "Into The Unknown" without the orchestral string accompaniment. From the album ASTRAL PROJECTION. 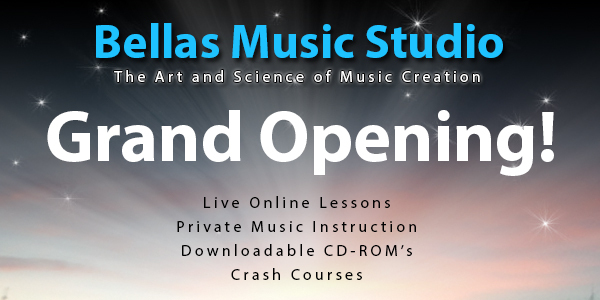 The brand new Bellas Music Studio is now open. 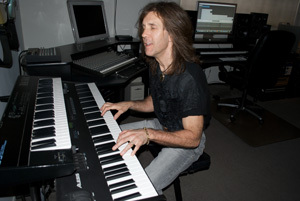 Bellas Music Studio offers a variety of music education products and services that were developed by composer and international recording artist George Bellas. 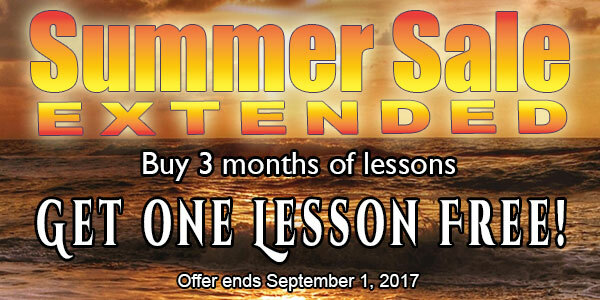 Products and services available include Live Online Lessons, Instructional CD-ROMs, Private Music Instruction, Crash Courses and more. 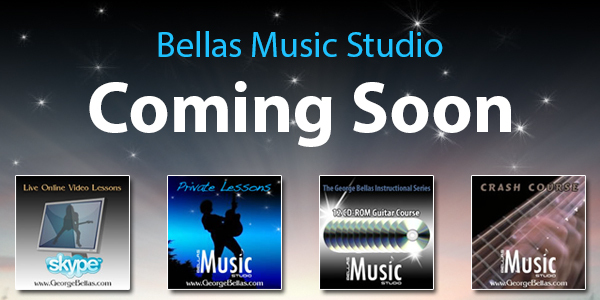 Bellas Music Studio is launching a new online store in May 2016. Bellas Music Studio offers a variety of music education products and services that include Live Online Video Lessons, Instructional CD-ROMs, Private Music Instruction, Crash Courses and more. A score excerpt to the composition "We Are Not Alone" from George's album "The Dawn Of Time" is now available. This is a neoclassical composition that incorporates two-part counterpoint between the guitar and bass and is rich in emotionally-drenched guitar improvisation. all the numerous elements heard throughout his solo career." and instrumentalists of the modern progressive rock world these days." Advance your skills with composition and guitar performance classes with George Bellas. 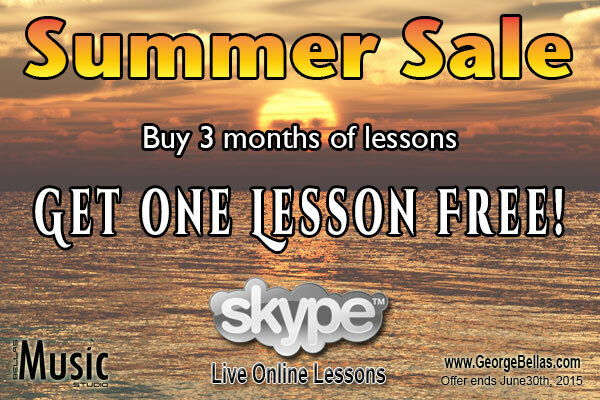 Purchase 3 months of Skype based Live Online Lessons and receive one FREE lesson! Live Online Lessons is a Skype based lesson program that offers composition, guitar, orchestration, and recording classes with composer and guitarist George Bellas as your instructor. 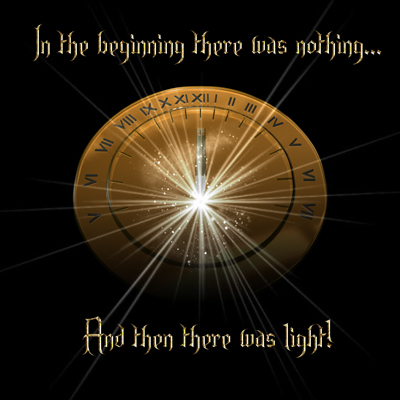 A score excerpt to the composition "Primordial Atom" from George's album "The Dawn Of Time" is now available. This is a neoclassical composition that incorporates rich harmonic language with a romantic flair. 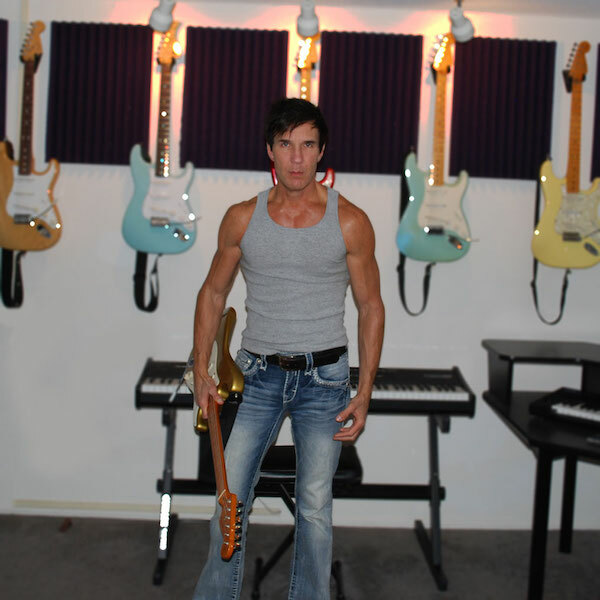 all the numerous elements heard throughout his solo career..."
Live Online Video Lessons is a Skype based lesson program that offers composition, guitar, orchestration, and recording classes with composer and guitarist George Bellas as your instructor. This program presents a myriad of unique challenges that continuously strengthen and develop your skills as a composer, guitarist and recording artist. The score to the Coda section of the composition "Visiting An Alien World" from George's album "Astral Projection" is now available. This composition uses a myriad of odd time signatures that are built upon an assortment of eccentric modes, including the Enigmatic and Octatonic scales along with modes of limited transposition. and great interplay between the guitar and keyboard lines." 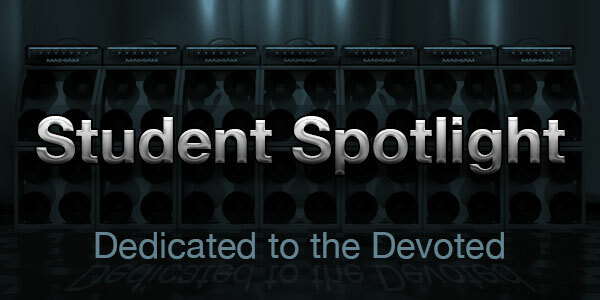 Additional students that have studied with George have been added to the Student Spotlight page. Information and sound clips are available that showcase the tremendous talent of these dedicated and hardworking individuals. The musicians that are showcased are current and former students that have studied composition and/or guitar with George via Live Online Video Lessons, private lessons, The George Bellas Instructional 12-CD ROM Series, or have flown in from around the world for the Crash Course. Out of several albums that are completely written, guitar and bass are currently being recorded for the next album that has been selected for release. Album title and other details to follow. 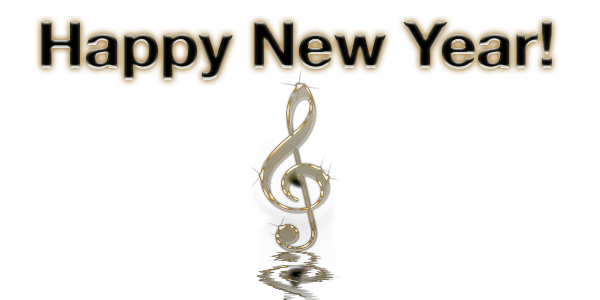 Ring in the new year with composition and guitar performance classes conducted by George Bellas. 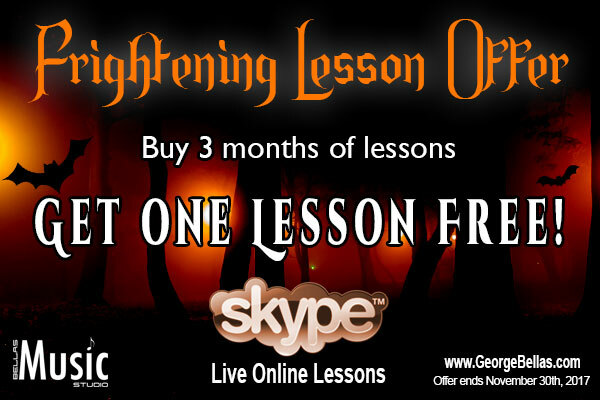 Purchase 3 months of Skype based Live Online Lessons and receive one FREE lesson! Guitar Goblins and Composing Wizards Beware! 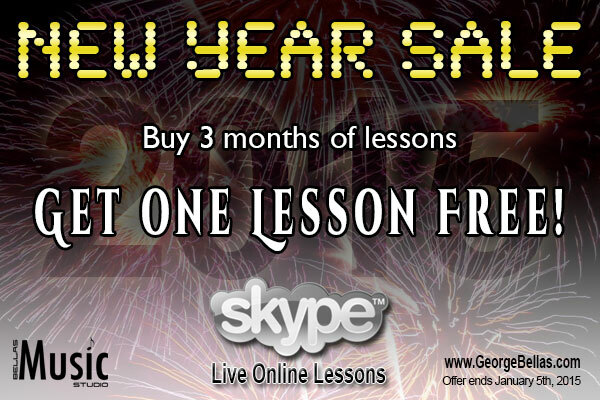 Purchase 3 months of Skype based Live Online Lessons and receive one FREE lesson! The more you book in advance the more you save. Guitar goblins and composing wizards beware! The score for the composition "Dimensional Portal" by George Bellas from the album Astral Projection is now available for download. Dimensional Portal is a futuristic progressive composition built with a variety of ultra-modern compositional devices. The score for the transition into the recapitulation of "Visiting An Alien World" from the album Astral Projection is now available for download. "Visiting An Alien World" uses a myriad of modern composing devices, such as odd-meters containing highly syncopated rhythms that are weaved within creatively orchestrated outlandish atonality. Download the Score to "Visiting An Alien World"
with idea after idea without much letup..."
no less than extravagant instrumental rock." "George Bellas belongs to the elite group of guitarists who truly entertain the listener with their instrumental albums. 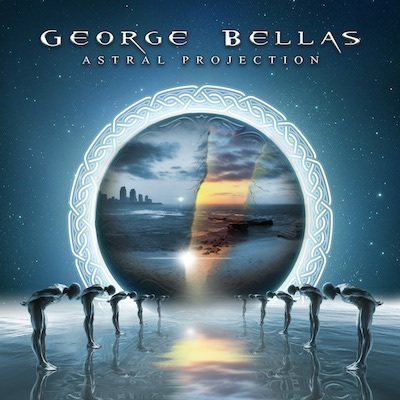 In terms of notes played on this album, this is extremely good value... 'Astral Projection' has truly set the benchmark for George Bellas albums going forward." "Bellas has established himself with this album as a genre of his own." 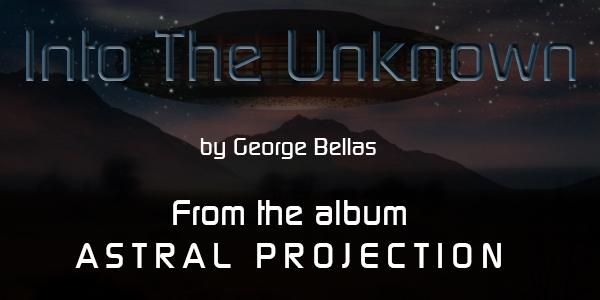 Underground World Magazine recently interviewed George Bellas to discuss the finer details about his new album "Astral Projection", including the writing and production process along with other insights into his upcoming albums. "An exploratory soar of fantasy for the fast-fingered guitar master. to reveal Bellas’ talents not only as composer but also as classical arranger." The score to the Coda section of "Magnetic Anomaly" from the album Astral Projection is now available for download. Magnetic Anomaly is one of the more eccentric songs on the album and contains a plethora of modern composing devices throughout the song. if you like guitar wizards, you certainly got to listen to this." 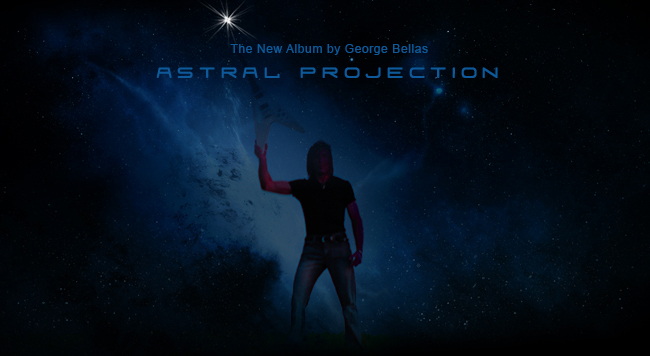 Hi-definition album art of George Bellas' latest release "Astral Projection" is now available. If you would like a hi-resolution copy of the album cover click the link below to download. Artwork created by Andre Beckston. Released June 21st, 2013 on the Lion Music record label. "Very inventive, well composed album by shred-meister Bellas. More than just fast shredding, he writes exciting, complex music." "George is a really talented musician who has his own style . [Astral Projection] could come together to form a modern symphony. It's tracks like " Magnetic Anomaly ," the strange "Visiting an Alien World" and "Interdimentional Travel" which sounds like the soundtrack to an as yet unmade film... more than 70 minutes and my head explodes." 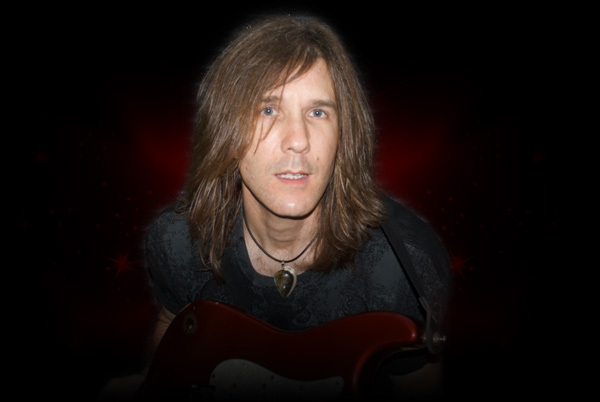 "Once again George Bellas proved that he is a real guitar virtuoso, a good arranger and a talented composer. With “Astral Projection” he extended his creativity adding new elements to his music. The production is excellent; the sound is clean and rich. Another decent release that could be recommended for fans of Progressive and Shred Metal." "George Bellas's discography is enormous, both solo and in collaboration with or support from other artists. George is a versatile man. He is a guitar wizard, a multi-instrumentalist, he teaches, produces, records and performs. He composes masterpieces in different styles, from neo-romantic to (neo) classical and progressive rock..."
"The overachiever of the six strings American George Bellas is it again by offering a new album on Lion Music... the notable exception of "Interdimensional Travel" is over eleven minutes... this title is solid and sounds like a movie soundtrack . There's no denying George's talent and technical expertise with Astral Projection... it's pretty amazing." "On Astral Projection Bellas introduces fifteen instrumental tracks. He composes everything, he arranges it, he produces, he writes all the guitar, bass guitar, drums and keyboards. The music, as usual, is very original and more than difficult, not to say "twisted", but in terms of rhythmic structures and melodies. All played with extreme virtuosity." "Bellas was signed to Shrapnel Records in the 90's and immediately became the new young god in the small community of hyper fast picking worshippers, one of the most sought after hired guns for the guitar aficionados and toward the larger audience he was one of the new in vogue hot-player..."
"Sorcerer George Bellas gives us a new wizardry craft this month with a creation called Astral Projection. 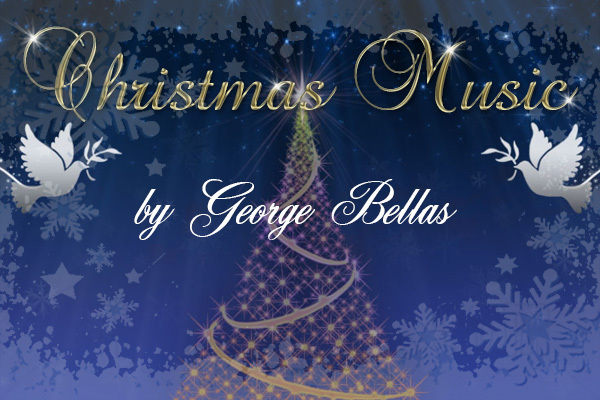 Once again he put in some celestial finger flying musical transformations into this creation... We need to appreciate how creative George Bellas is handling all other melodic instruments, the orchestration etc, and still come with interesting playing." "Bellas is quite a shredder but his music is much more focused on an epic compositional style that utilizes his technical skills for drama, not just for show... Tons of exciting guitar work, dramatic melodies and great interplay between the guitar and keyboard lines. This is extremely bombastic music that hits you over the head with idea after idea without much letup..."
"George handles the bass and keyboard duties in addition to his dazzling proficiency on the axe. The 15 tracks mix up exotic scales, eclectic rhythms, and an overall outer world feel... Do not fret guitar mavens - there are plenty of jaw dropping shred worthy sections to sink your teeth into..."
"Overall this album is an impressive body of work that begs to be listened to, but it might not be for everyone out there... If you’re looking for some new instrumental music to shred your face off with – this is a solid contender." "Symphonic prog rock with a guitar sorcerer - GEORGE BELLAS... The extremely technical savvy, yet still highly melodic playing of Bellas, whose warm, singing lead guitar sound dominates the sound... Bellas, who delivers some technical showpieces, where one can only tremble with the ears." 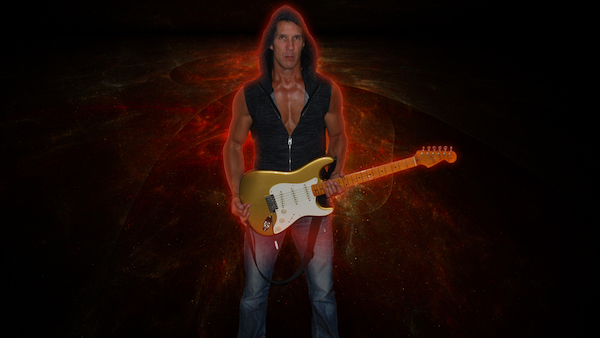 "George Bellas guitar wizard presents "Astral Projection", his new album. Once again, Bellas surpasses himself and takes this album into progressive shoals, which has never before seen a mortal guitarist." "Bellas’ guitar-playing skills are phenomenal, the album has a remarkable sense of melody and there’s a lot going on to sink one’s teeth into. 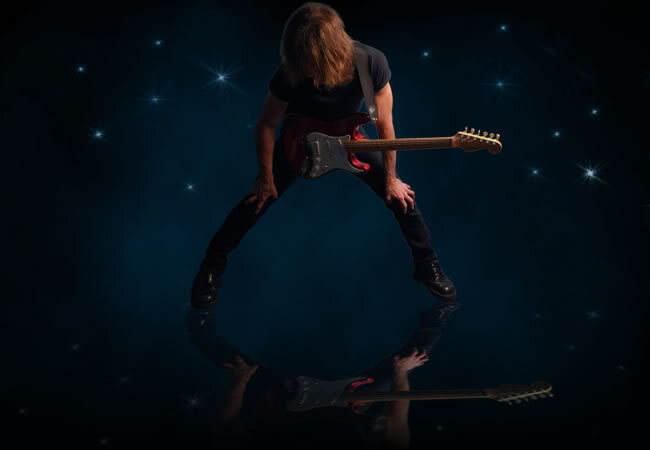 Bottom line: “Astral Projection” is a fine display of music craftsmanship..."
"Astral Projection is the latest release by guitarist extraordinaire George Bellas (also handling bass and keyboards). Those familiar with Bellas’ solo work know he typically jam-packs as many twists and complexities into his compositions as humanly possible." "When I'm needing something mind expansive, "Astral Projection" serves its purpose." "George really is a master composer/arranger, wow... impressive." 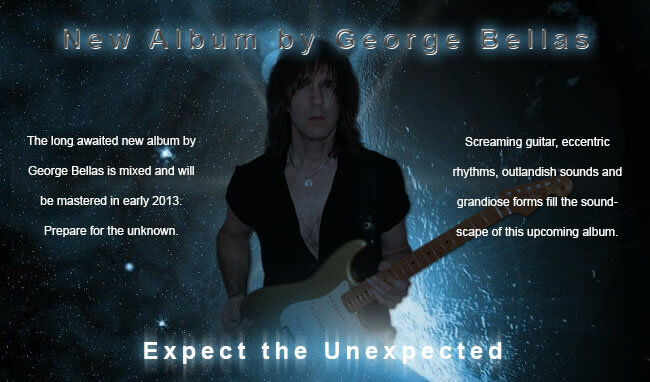 The new George Bellas album will be released June 21, 2013. Release date for the new album Astral Projection is imminent. Live Online Video Lessons is a Skype based lesson program that offers composition, guitar, orchestration, and recording classes with composer and guitarist George Bellas as your instructor. This program contains one of the most comprehensive set of lessons available today. Each lesson is designed to efficiently work towards accomplishing the goals of the student. Live Online Video Lessons are available for computers, tablets, and cell phones. Artwork for the upcoming George Bellas album will be created by artist Andre Beckston, A.K.A. Monowasp. Andre's artwork appears on an assortment of Steven King books, numerous band CD's, websites, along with other various types of promotional media. Mixing for the new George Bellas album is complete. The album will be mastered during the first week of the new year and then sent out for release. The album was mixed with the dynamic range left fully intact, which came out to be on average about 10db of dynamic range. Availability and additional details will be posted in the coming weeks. Hold on tight, the earth is going to move uncontrollably today! Drummer extraordinaire Marco Minnemann will be recording drum tracks for the new George Bellas album this week. Drum recording begins today, and once the drum tracks are completed the album will be mixed and mastered and then ready for release. Since the release of his previous album "The Dawn Of Time", George has had one of the most prolific writing periods of his career. An exciting announcement will be made in the near future regarding the initial release of the several catalogs of new music that has been recorded. 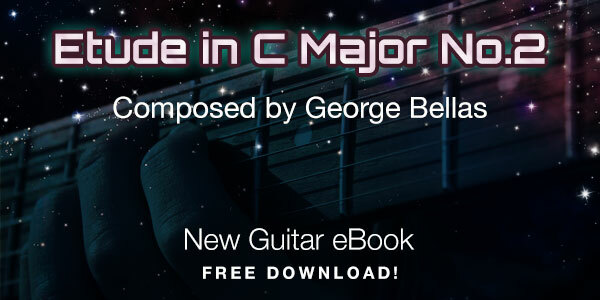 In association with Arobas Music, makers of Guitar Pro software, George Bellas presents an article featuring an exclusive countrapuntal based, classical guitar etude of which is analyzed in his own words. The harmony and voice leading in this piece, along with performance notes, are all broken down and discussed in detail. 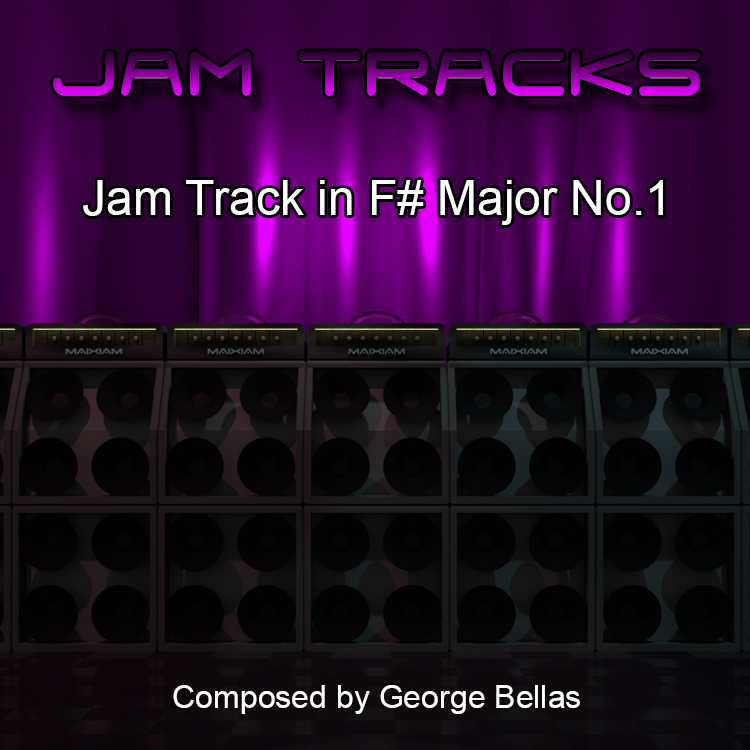 All music was composed by George Bellas using Guitar Pro 6 software by Arobas Music. Download the associated Guitar Pro file for free and read the article at the link below. 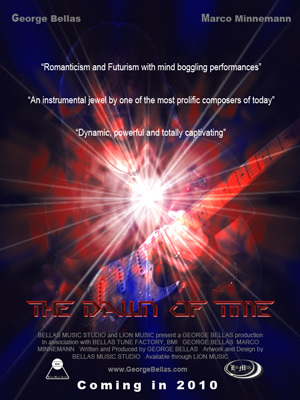 Song descriptions and other production details for the album "The Dawn of Tiime" are available for reading. George reveals the concepts and inspiration for each song, the equipment used for the recording, along with insight into the writing process. Chrome, Safari or Firefox are required for listening. This music is a gift for all those interested. 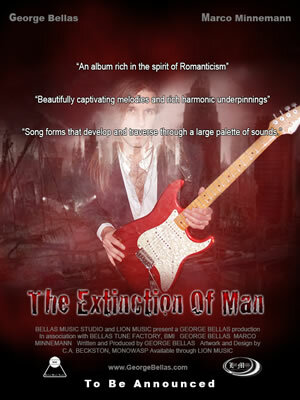 The upcoming new album by George Bellas "The Extinction Of Man" is nearing the final stages of production. Information regarding the release date will be posted as it becomes available. During March of 2011 George Bellas composed a large contrapuntal project yielding 108 minutes of new music. This body of work consists of 30 Palindrome Canons in a strict 18th century counterpoint style and contains one in every key, including enharmonic keys. Each piece contains a melody that is heard forwards and backwards simultaneously. Some consider palindrome canons to be an intellectual stunt that exhibits a composers technical prowess and ingenuity, but these in particular have real musical value with engaging melodic themes. The Palindrome Canons when released will include the accompanying scores. The ADA MP-1 guitar preamp that George used on his debut album "Turn Of The Millennium" is for sale on Ebay (SOLD). The preamp has been signed and dated by George and also contains pictures of the signing. Also included is the ADA MC-1 MIDI foot controller along with several custom patches programmed by George Bellas. Own a piece of guitar history today. 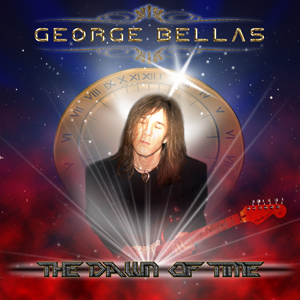 "The Dawn of Time" by George Bellas was the # 1 selling album of the year in 2010 at Guitar Nine Records. During November of 2010, two other albums by George were also in the top ten selling albums, with "Step Into The Future" coming in 4th place and "Planetary Alignment" coming in 5th place. "The Dawn Of Time" was released July 16th, 2010 on Lion Music. "The Dawn Of Time" was also the #1 selling album for the months of July, August, October and November of 2010 at Guitar Nine Records. It ranked 3rd in September and 4th in December. Out of more than 2000 album releases worldwide, "The Dawn of Time" by George Bellas is ranked number 14 in the Progressive X Grooves top 50 albums of 2010. "The Dawn Of Time" was also the number 1 seller at Lion Music during the summer of 2010. 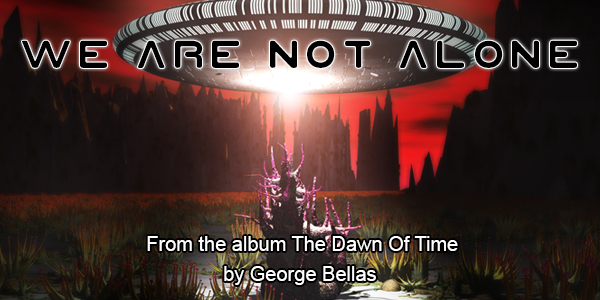 The new album by George Bellas, "The Dawn Of Time", is getting regular radio airplay across Europe. The radio station Rocktopia is airing the title track as instrumental of the week. George Bellas has recently composed a new album that is chock-full of epic themes, rich harmonic underpinnings, intricate rhythms and advanced forms. Recording is scheduled to commence in November 2010. Drumming legend Marco Minnemann will once again be laying down the drum tracks. Further details regarding this new album will be revealed through progress reports during the production process. Prepare for some exquisit romanticism. Epic themes and grandiose forms packed into an 80 minute new album! 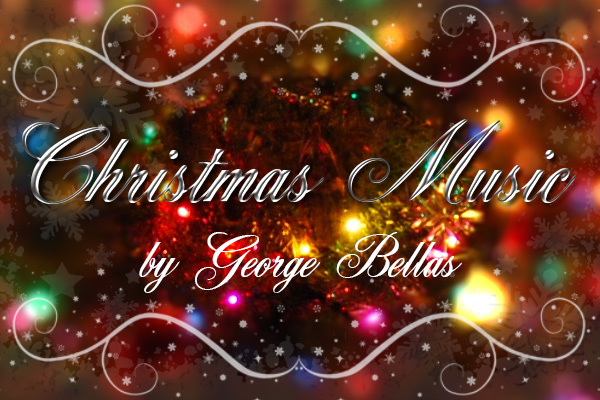 The new album by George Bellas is out! "George Bellas' The Dawn Of Time is sure to be a welcome release by anyone who appreciates skillfully performed music from two master musicians, which is both diverse and imaginative... So this dynamic duo is back with more first rate performances, as they do their part in keeping top notch instrumental music alive and in great shape..."
"Guitar aficionados and fiends will love the new release from George Bellas, The Dawn of Time... Bellas again mesmerizes us with his brilliant bag of guitar tricks. Virtuosity is a word not wasted on this fret wizard... "
"George Bellas can hardly be called a novice when it comes to recording albums dense with displays of neo-classical virtuosism... By and large the music in “The Dawn of Time” is stunning and certainly delivers to its expectations..."
The new album by George Bellas goes on sale July 16th, 2010. An instrumental jewel by one of the most prolific composers today. The Dawn Of Time is a collection of songs that contain many aspects of George's neoclassical and progressive styles that have been displayed throughout his career. Creative writing, lyrical melodies, counterpoint, expressive phrasing, mind-blowing performances, and a flair for scientific underpinnings are all contained within this new release. Fans of George's neoclassical style will find a multitude of offernings to enjoy, as will fans of the more progressive side of George. To celebrate the release of new albums from world acclaimed guitar virtuosos George Bellas and Alex Masi on July 16th, Lion Music are celebrating "Guitar Virtuoso Month" in July 2010. The whole of July will see exclusive interviews with guitarist's on the label's roster, special offers on releases from the Lion Music store and a whole host of other goodies. Be sure to not miss out on the action by checking back at the Lion Music site regularly or joining the Lion Music Facebook page. George Bellas' debut album was released on May 20th, 1997. 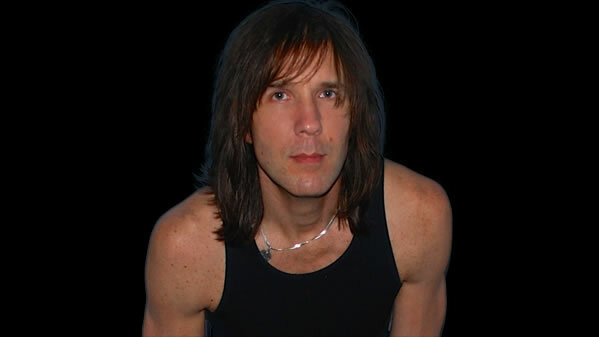 Mike Varney of Shrapnel Records signed George in late 1996, and months later George's debut album "Turn Of The Millennium" was released. The album features ultra-progressive writing which contains intricate rhythms, exotic modes, lyrical melodies, over-the-top performances, and is chock full of guitar improvisation. Several months ago George composed a brand new album that is heavily immersed in Romanticism. The writing and scoring for all the parts were completed within a three week period. Recording for the album is scheduled to commence in early summer of 2010. Further details will be revealed after "The Dawn Of Time" has been released. 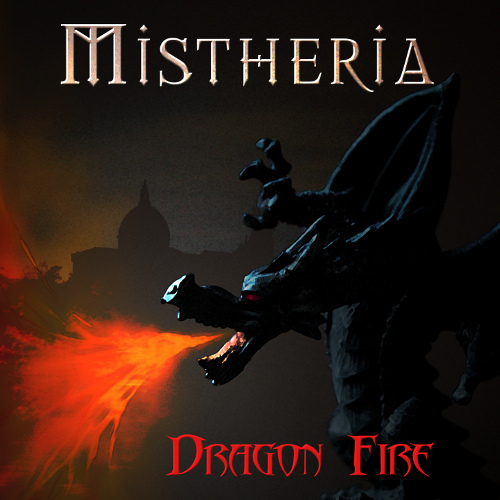 George Bellas recently collaborated with Italian keyboard maestro Mistheria on his new album entitled "Dragon Fire". The album features several world class musicians, which include singers; John West (Artension, Royal Hunt); Mark Boals (Ring Of Fire, Yngwie Malmsteen, Uli Roth); Rob Rock (Impellitteri); Lance King (solo artist); Titta Tani (Astra); and more. "Dragon Fire" will be released later this year on Lion Music. 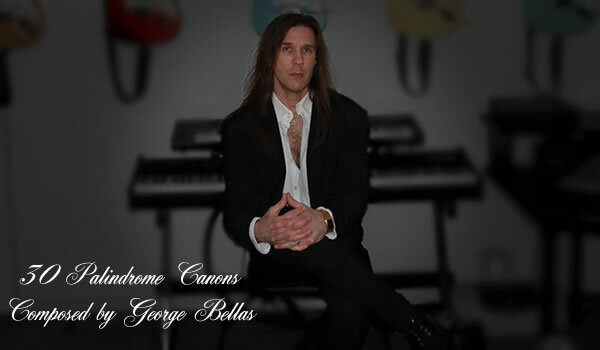 The new album by George Bellas will be released on July 16, 2010 on the Lion Music record label. This new album sees George reasserting his neoclassical stance while also intermixing more modern progressive elements. "The Dawn Of Time" contains 19 songs deeply rooted in Romanticism and Futurism with a total running time of 79:57 mins. Combining elements of Romanticism and Futurism with mind boggling drum performances by Marco Minnemann, and guitar, bass and keys performed by George Bellas, "The Dawn Of Time" is an album brimming with exceptional musicanship and ultra unique writing. 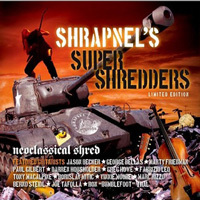 George appears on the new Shrapnel Records release "Shrapnel's Super Shredders". This is a limited edition release and features Shrapnel Records recording artists: Jason Becker, George Bellas, Marty Freidman, Paul Gilbert, Darren Householder, Greg Howe, Fabrizio Leo, Tony MacAlpine, Borislav Mitic, Vinnie Moore, Marco Rizzo, Bernd Steidl, Joey Tafolla, and Ron "Bumblefoot" Thal. An open letter was written by George Bellas to help increase awareness of music piracy. This letter is also included in a piracy awareness campaign started by Lion Music which includes several of their recording artists speaking out about the issue. "The Current State of Music Piracy"
Together for the first time on record, three Shrapnel Records alumni, Vinnie Moore, George Bellas, and Michael Batio, perform on the song "Symphony Of Destruction" from the album "Hands Without Shadows" by Michael Batio. Vinnie Moore plays the 1st solo, George Bellas plays the 2nd solo, and Michael Batio takes the 3rd solo. George also composed a 3-part counterpoint section for the album which appears right before his solo. 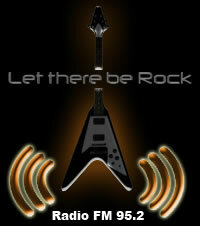 The radio station "Let There Be Rock" FM 95.2 will have a feature presentation about George Bellas and his music on September 29th, 2009. The special will feature some of George's favorite songs that were influential to him as he was growing up, and also have George comment on some of his personal favorite performances. Live internet stream and FM broadcast available. George Bellas will be conducting a Masterclass on "Composition Elements & Techniques" at HESSFEST 2009 on Thursday, September 10th, 2009 at 3:00 PM. This is a private event for select students and is not open to the public. Recording of the new album is complete and will be mixed in the following weeks. For the album George used an assortment of gear that includes; Strats, Les Pauls, Flying V's, a Musicman Stingray bass, a Precision bass, Marshall amps, and an Ampeg SVT Classic. Laying down the low end with a Stingray. "The Dawn Of Time" will be released worldwide in 2010 on Lion Music. 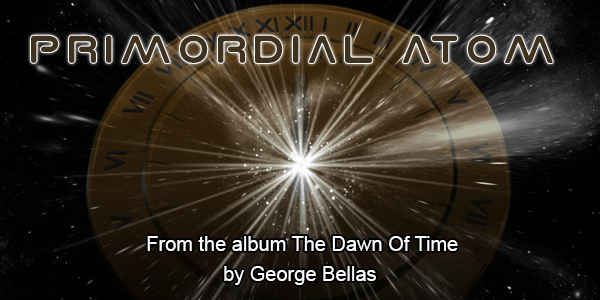 The upcoming new album "The Dawn Of Time" by George Bellas will be mixed in early August. The material on this album is a stylistically diverse collection of shorter 3-5 minute songs, some of which are complex, and others that are more traditional in a true neoclassical style. 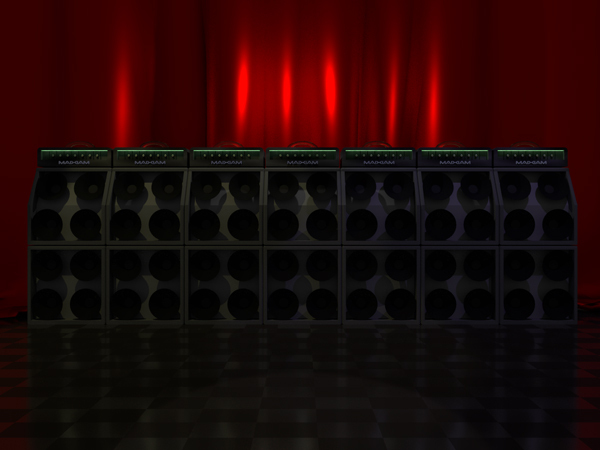 An extreme amount of attention went towards obtaining the highest quality sound for each instrument. The guitar, bass, drums and keyboards all sound awesome. And once again, Marco Minnemann recorded some absolutely phenomenal drum performances. 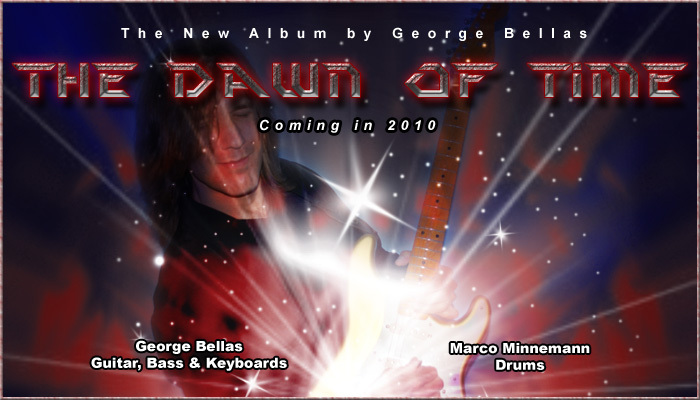 The new album "The Dawn Of Time" by George Bellas is complete and in the final stages of production. "The Dawn Of Time" is scheduled to be released in 2010. This upcoming album consists of 19 songs and is 80 minutes in length. The style of the album is a combination of Neo-Classical and Progressive. "The Dawn Of Time" will be released worldwide on Lion Music. "When I casually glanced at the new album on the Lion Music download center I noticed that this Bellas album only had one track available for download, and thought to myself that it must be a promo song for his upcoming album or something which is not uncommon to see in the music business. After the download started I walked away and came back several minutes later and it was still only about 10% done. "Hmm, Surely it would have been done by now. I do have broadband," I said to myself. It was then I realized that there was something special here, because after going back to look again track 1 on the disk was 75 minutes long! What could it be? Did Lion Music compress the whole album into one download for convenience? No, their other albums aren't like that. What is it then? Did George Bellas really write and record one song that's 75 minutes in length? My curiosity was piqued..."
"But an album with one 76 minute song on it means several things to me. One, that they have definitely stretched some musical boundaries, especially in the world of instrumental guitar albums. And two, that they are intellectually capable of writing such a song. He has my attention..."
"Sounds pretty intriguing, and indeed the album really is. Thankfully it is not chock full of some guy playing 64th notes and arpeggios as fast as humanly possible the whole time. There's real song structure here writing in the prog epic style, with lots of dynamics and plenty of imaginative ideas, odd time signatures, and slow and fast-paced passages. There is musical genius here, that much is clear..."
...it exposes not only Bellas’ abilities as one of the most innovative axemen, but also one who can clearly communicate with his instrument in way that so few shredders know how to; he knows how to make speed work to make it sound appealing to the ears instead of just playing lightning speed arpeggios for the sake of being technical. It’s only January and one of the first contenders for instrumental guitar album of the year has already arrived." "The range of influences at play from the opening section to the last note are astronomical, and actually even include some references to composers known for writing intergalactic sounding anthems. Jazz ballad section and abrupt references to mixed meters trade places with violin-like volume wells and blurring flurries of arpeggios and speed picking. Neo-classical and world music references come in and out, occasionally resembling tribal drum choruses with otherworldly Middle Eastern thematic material from the guitars and keyboards, at others switching up between Bach preludes and Beethoven piano sonata references. At certain key points the synthesizer atmosphere conjures up images of triumphant prog. 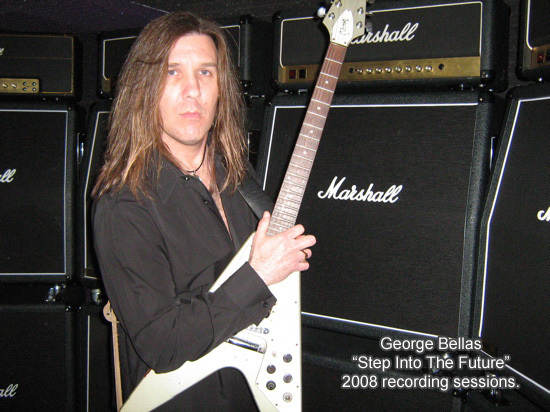 rock bands like Yes and Asia, while the thematic material within these ambient lines occasionally resembles music from the “2001, A Space Odyssey” soundtrack..."
"If 75-minute instrumentals are your thing, guitar virtuoso George Bellas has done a heckuva job catering specficially to your tastes with Step Into the Future. What Bellas has cooked up here is a full course meal. 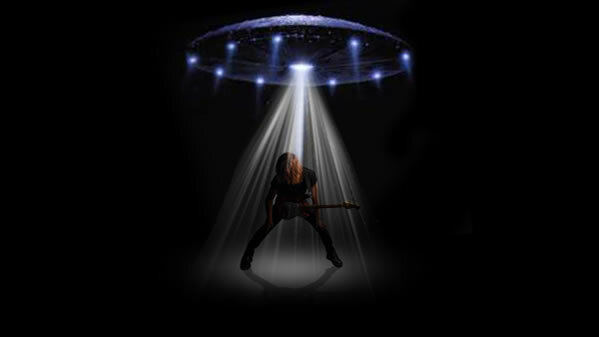 There are countless treats for any metalhead with functional taste buds to sink his teeth into on Step Into the Future: It has great, varied beats, ever-changing moods and around three million solos on both the guitar and keyboard. No matter where one decides to take a bite--be it nine minutes in, where the action is slowed down and the solitary keyboard is accompanied by female chanting, or near the 37-minute mark, where one's mind will promptly be bent and sent into outer space--the ingredients are all quite tasty..."
"Although I would personally rate this as a bold and extremely entertaining listen, your average metal fan will probably have a little trouble getting past the time required for one complete listen. It could be called a sort of instrumental metal gnosis, only being available and understandable to those with the desire to dig deep and to ponder over things longer than your average listener. But regardless, George Bellas is one of those amazing instrumentalists that have been reminding the world that America can still produce musicians with the ability to play more than 3 or 4 lousy chords. If you’ve got the time to spend, and you are not one to be straight-jacketed by the concept of progressive music having to fit a certain stylistic template, this is something to check out..."
The new album by George Bellas will be released on January 23, 2009. The album will be released worldwide through the Lion Music record label. 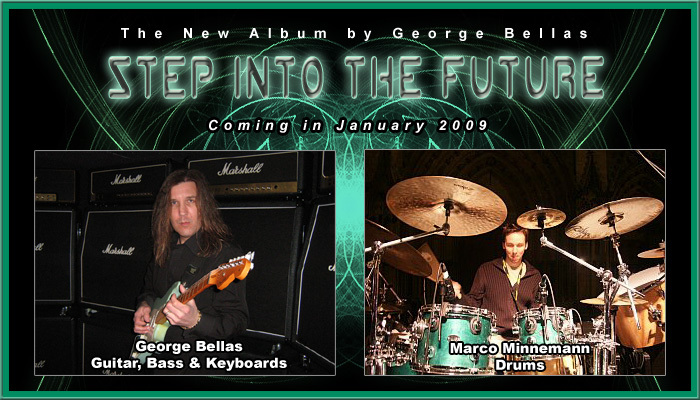 The album "Step Into The Future" by George Bellas will be released in January 2009. This new album consists of one song that is 76 minutes in length. The album will be available worldwide on Lion Music. 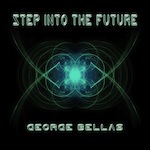 The new album "Step Into The Future" by George Bellas is complete and in the final stages of production. This new album is the most massive body of music that George will have ever released. It was composed in an intense frenzy of inspiration between December 9th, 2007 and January 12th, 2008. The writing process took place every single day with George frantically composing note by note with only paper and pencil. The album once again stretches the boundaries of the composer's prolific abilities and utilizes compositional elements not found on any of his other releases. "Step Into The Future" is ultra-modern and progressive in style and very elegantly displays a vast dynamic range of sound. There are melodies on the album that are pin-drop soft, subdued and spine-shivering, and then there are moments of bombastic explosiveness that reveal an entirely different madman type character. There is a big surprise to the album that will be revealed just prior to it's release and will instantly set it apart from the current trend. "Step Into The Future" will be released worldwide on the Lion Music record label. "Maestro George Bellas departs from the neoclassical excursions he is best known for on his latest release PLANETARY ALIGNMENT, a mind-boggling exercise in advanced musical concepts that simultaneously frustrates and inspires. Bellas is scary good, with a comprehensive knowledge of music theory making him a veritable human compendium of obscure chords, scales and rhythmic ideas, and on PLANETARY ALIGNMENT he introduces the listener to a startling array of them. Check out the drama of "New Worlds Discovered," the creatively explosive "Parallel Universe," the space trip-out "Gravitons," or the intense "Supersymmetry" for samples of George's prowess..."
"With the release of “Planetary Alignment”, George Bellas has to be seen as one of the virtuoso guitarist/composer’s of his generation. The music on this release isn’t just melodic rock soloing over rock steady drumming and standard rhythms, it’s exactly the opposite and, as a result, is a totally refreshing listen. Even to my ears that like their regular dose of Satriani style playing there comes a moment when you wish someone would just be brave enough to take all those techniques they have learnt and mould it into something different. For many that would mean leaving the comfort zone and doing something that might see them fall flat on their fret boards. To be honest the ability to do that would also involve someone who is harmonically trained, someone who knows the rules and is therefore aware how to break them, that’s how music moves forward." 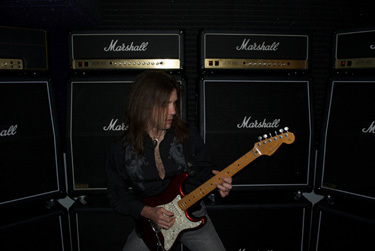 "It appears that guitarist George Bellas is determined to keep the electric guitar virtuoso scene alive, his last few releases have seen a steady pushing of the envelope and setting new personal standards for not only his performing skills, but an elevated standard in sophistication for compositions as well. 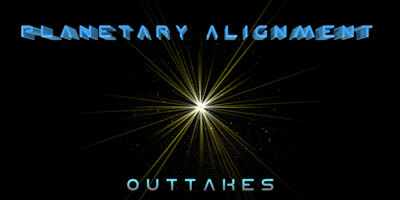 This latest release - Planetary Alignment sees Bellas taking his compositional direction into the most progressive standards I have heard him do, while his last project - Palace Terrace offered a nice take on Neo-Classical progressive metal, what he has done with this cd is much more." "It is without a doubt, almost a certainty, that one needs to listen to and explore the musical aspects and content of this new release many times over before one can appreciate it for what it is -- a masterpiece of individual and complex pieces of art (in the truest sense of the word). Only then will Planetary Alignment come into focus and let your mind explore the treasures found within it. This album is not for the faint of heart or the musical listener who likes to rush through an album without actually taking the time to let it speak for itself. For those who truly love the guitar sound and really appreciate virtuosos who really are just that, this is a must buy. If you aren’t in that category, you might want to listen to a friend’s copy first to see if is right for you." "This has to be the hardest working guitarist on the planet (pun intended). Just under a year ago, he released his project Palace Terrace. Now, he’s back with a new solo offering. I have heard this man perform on many artists records as well as his own and I have to say that he has managed to outshine himself here as he has gone out to create a record that simply makes you say…WOW! I must admit that the whole neo-prog metal scene is getting quite boring now and even as much as I love Yngwie, his music is even redundant after a while. So, what must be done to keep things fresh or try to put a different spin on the scenario? Simply add attitude and intensity while you are sincere at the same time." "Whilst “Planetary Alignment” may not be as immediately “understood” as other instrumental releases reviewed this month (Marco Sfogli, Paul Gilbert) don’t let that put you off as George is more unique and definitely has his own sound going. Granted you can hear a little Uli Jon Roth and at times Brian May in here, but Bellas has carved out a sound, technique and method of writing that is so unique is impossible for it to not attract your attention. Just be prepared to sit down with this album and absorb it over numerous spins. The epic 8 minute opener “Colour By Numbers” kicks the album off in a very progressive manner and from here on it George introduced other themes, subtleties and ideas throughout the rest of the album." The new instrumental album by George Bellas is arguably the most progressive album yet from the world renowned guitarist and composer. Uniquely crafted, be ready to expect the unexpected. 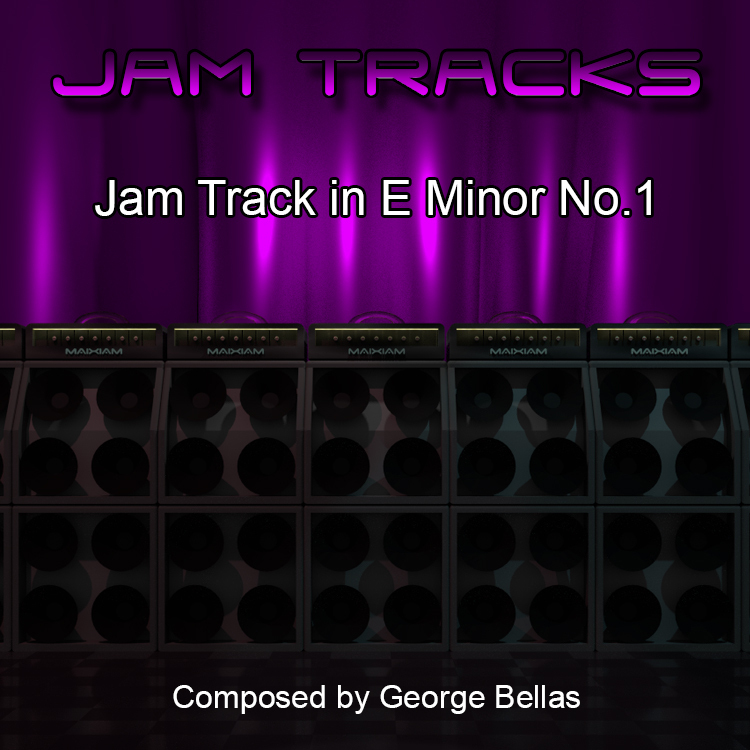 Progressive neo-classical rock from George Bellas. Palace Terrace is Bellas' first vocal project full of soaring vocals, rich harmonic passages, complex arrangements with a virtuoso symphonic approach. 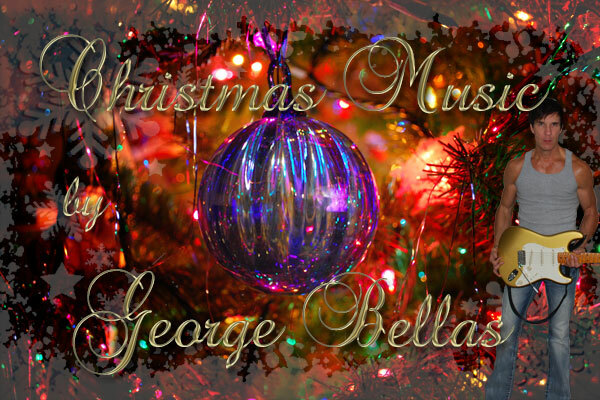 The new album by George Bellas will be released on February 15, 2008. 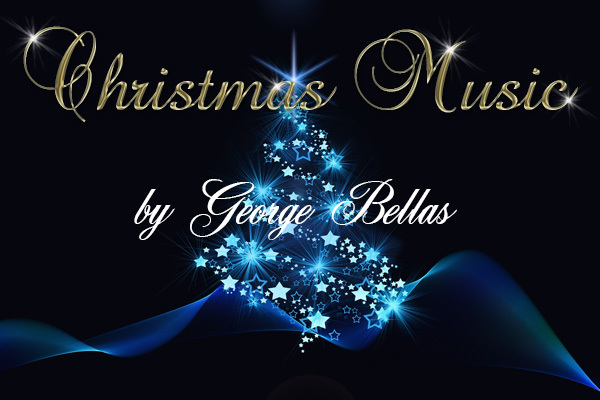 The new album by George Bellas will be released on November 16, 2007. 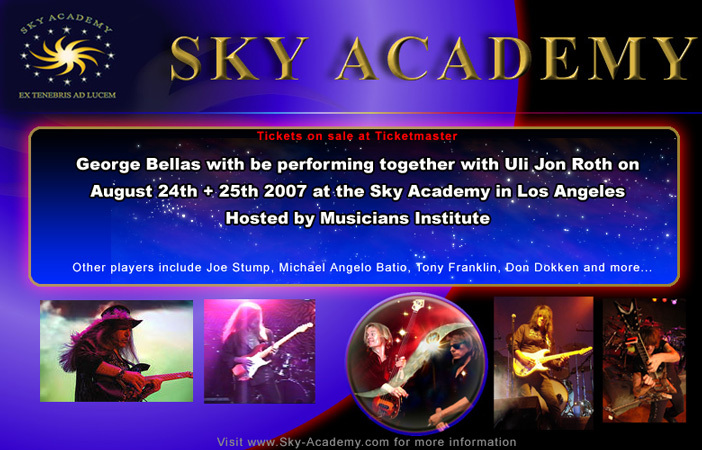 George Bellas will be performing live with Uli Jon Roth, Paul Gilbert, Joe Stump, Michael Batio, Jonny Highland and Tony Franklin at the Sky Academy in Hollywood, CA., on August 24th and 25th, 2007. Tickets are available through Ticketmaster. 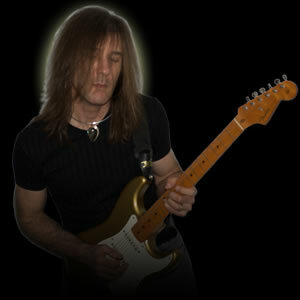 George Bellas will be conducting a Guitar Clinic and Open Counseling sessions at GIT on November 15th, 2007. Following the clinic, George will be performing a set songs from his solo albums in the main auditorium. 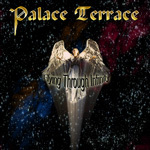 The debut album "Flying Through Infinity" by George's new prog band Palace Terrace is complete. Details regarding the relase date and other info will be revealed in the coming months. 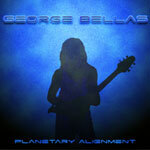 George's new instrumental album "Planetary Alignment" will be mixed, mastered and completed by July 31st. Details regarding the relase date and other info will be revealed in the coming months. George's Masterclasses at the ACADEMIA DE GUITARRA located in Malaga, Spain are confirmed for the beginning of June 2007. Reserve your time for a Masterclass by calling ACADEMIA DE GUITARRA at 952-32-88-40. George will also be doing some impromptu live appearances while in Spain.